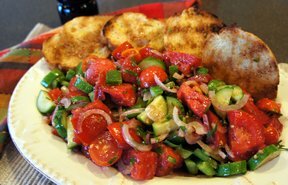 An Italian classic combining the great flavors of olive oil, tomatoes, and garlic. 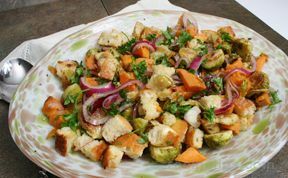 Remove crusts from bread and cut into 1/2 inch cubes. Melt butter in a large skillet until it foams. Add garlic, cook until fragrant (30 seconds to 1 minute). Add bread cubes and toss to coat with butter. Season with salt and pepper to taste and place on a baking sheet; toast in oven until crispy (5-10 minutes). 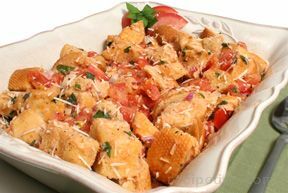 While croutons are toasting, mix all other ingredients, except for cheese, in a large bowl. 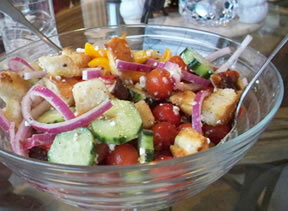 Add croutons, toss. Add parmesean cheese and stir. Sprinkle more cheese on top, if desired. Can be served on a platter or with large lettuce leaves on individual salad plates. "We brought this recipe to a dinner party and it was a hit. Some individuals at the party were gluten free, so we used a thicker gluten free bread. The thickness of the bread really worked well to absorb the great flavors of the dish itself!"